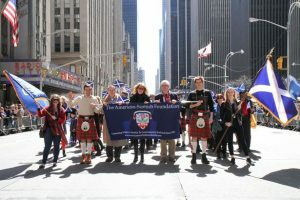 New York Tartan Week is just around the corner and what a fantastic celebration it will be with people coming from all over the globe to experience a uniquely brilliant event which has something to offer everyone. 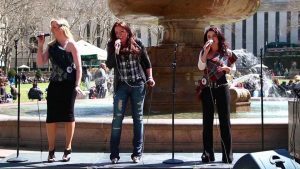 New York Tartan Week is a celebration of Scottish-American heritage culture and community and a brilliant experience which will see you wanting to come back each year for more! Music plays a central role in celebrating that shared community and culture; the music traditions brought over by Scots have survived and thrived in North America to this very day. It’s fair to say that the shared passion for music and culture has brought about real fusion and development of new style and approach whilst respecting the traditions of the past. Discovering new ways, paths and approaches has always been central to the Scottish-American identity and nowhere is this more evident in the culture and creations borne from our partnership and shared legacy. 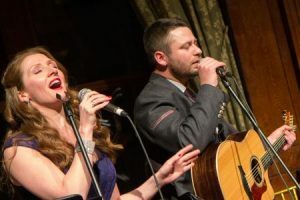 Music, as with the Scots-American heritage itself has experienced real innovation and fusion over the past few hundred years and you can hear Scottish influences in everything from Appalachian, folk and even country music. It’s fantastic that the old traditions are preserved an continued by many talented and passionate musicians across North America, some of which are performing at NYC Tartan Week this year alongside some musical guests from Scotland also! With live music performances all over the city there’s something for everyone and of course with a huge amount of pipe bands marching in the Tartan Week Parade on April 8th you can experience something truly unforgettable. (Tickets $25/30 adv) – Purchase tickets here. (Tickets $85 reserved/$65 general admission) Purchase tickets here. (Tickets $40 Balcony/$50 Prime Seating) Purchase tickets here. 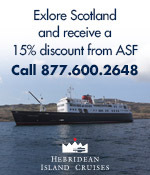 This entry was posted in Arts and Entertainment, ASF Events, Associate Events, News, Scotland-Tartan Week, Uncategorized and tagged B.B. Kings Blues Club, Beer Authority, Bonnie Brae Knights Drummers, Bryant Park, Connolly's Pub and Restaurant, Emerald Rae, Gleadhraich, Glengarry Bhoys, James MacMillan, Jamie McGeechan, Kodak Ghosts, Kyle Carey, Lathallan School Pipe Band, Little Fire, Mike Ogletree, NYC Tartan Day Parade, NYC Tartan Week, Oban School Pipe Band, Scottish Octopus, Shamrock & Thistle, St Andrews Pub, St Columba School Pipe Band, St. Bartholomew’s Church, St. Luke Passion, The Cutting Room, The Highland Divas, Wight Hot Pipes on April 3, 2017 by Theresa Schilling. 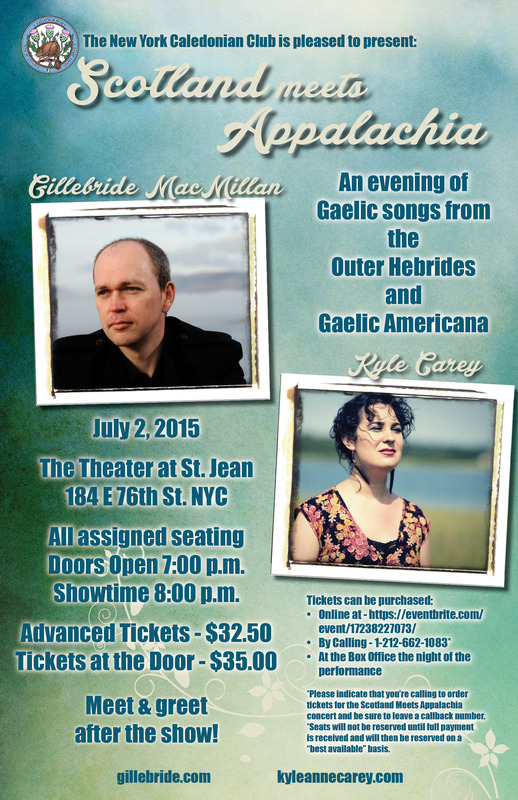 The New York Caledonian Club presents Gillebride MacMillan and Kyle Carey in concert at the Theater of Saint Jean, 184 East 76th St. Manhattan. Purchase advance tickets, $32.50, at website www.evenbrite.com or call 212-662-1083; or pay $35 at the door. 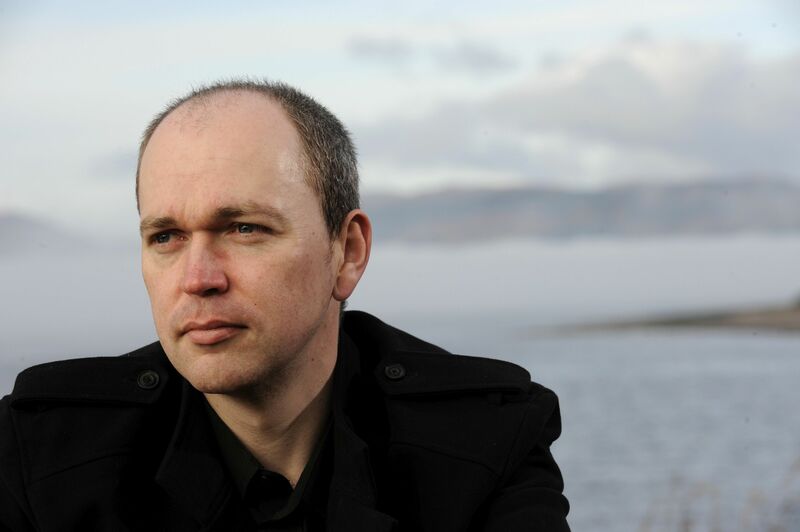 Gillebride MacMillan is one of the most sought-after Scottish Gaelic singers, a native Gaelic speaker from the Outer Hebrides. He also stars as Gwyllyn the Bardin the Sony Starz’ TV adaptation of Diana Gabaldon’s Outlander. 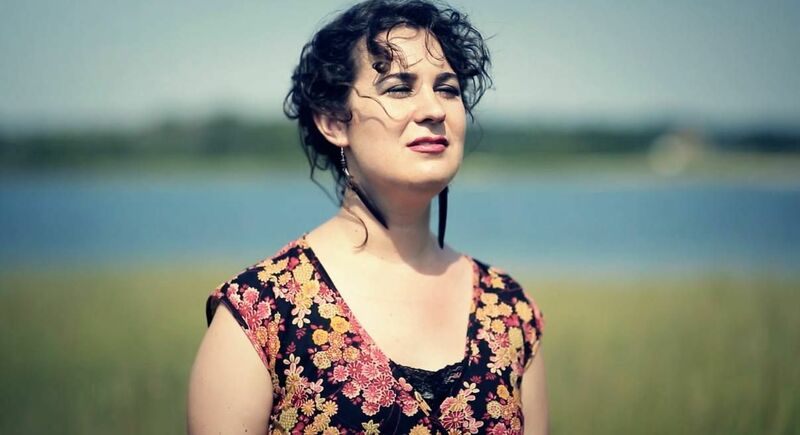 Kyle Carey’s music includes ingredients from the American Folk Anthology, the Appalachian poetry of Louise McNeil, the traditional music of Ireland, Scotland and Cape Breton. This entry was posted in Associate Events and tagged Gillebride MacMillan, Kyle Carey, New York Caledonian Club, Scotland Meets Appalachia, The Theater at St. Jean on June 24, 2015 by Sara Heegaard.